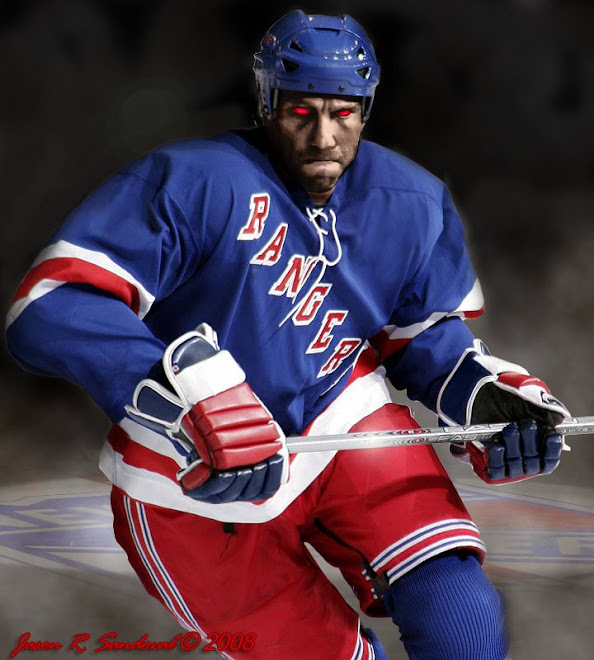 The Dark Ranger: Rangers escape with win despite attempted robbery at Igloo! Rangers escape with win despite attempted robbery at Igloo! Well Rangers Fans, it was a close one! Soon after sewing up our win against the the greatest odds, did our netminder call the officials on their one sided performance by requesting to see the record for the last 5 seasons of penalty tallies in Pittsburgh. You can get the official Report on the attempted Robbery here. For us at the Dark Ranger, We know what happened and don't need it dressed up by the league or the officials. After a hard fought first period, where we tried to match the intensity of the Pittsburgh team, it became apparent that we just weren't controlling the puck enough and our offense while well intended was fairly one dimensional...The Gaborik line alone was a little puzzling as his linemates seemed content to kick back and let Gabby enter the zone solo and try to split 4 defenders on his way to the net. 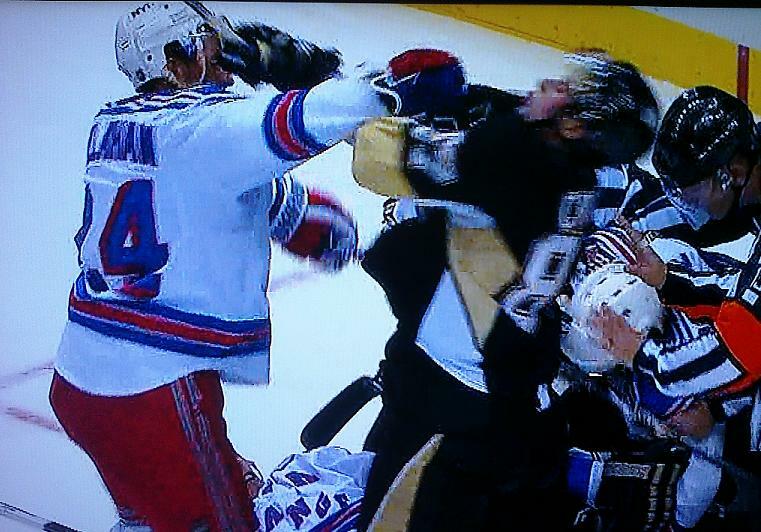 Quick Note: Kudos to Cally for dropping the gloves and shutting Comrie the hell up and later force feeding Skidmark Sid some glove during a scrum. The second brought more of an effort and intensity, as did the third. Interesting enough that we never got a call in the entire game, but once again diving seems to be popular in Pittsburgh. You have to love how a kid like Malkin is revered as big, strong and fast and so steady on his skates but somehow gets overpowered and thrown to the ice by little Ryan Callahan. 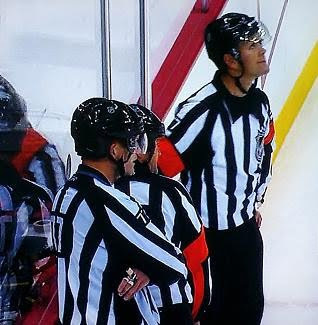 Once again, demonstrating the Pittsburgh motto of:"if you cant beat em, cheat em..." The officials of course, fall in line with this mentality making up calls along the way, justifying them with stupid smiles. 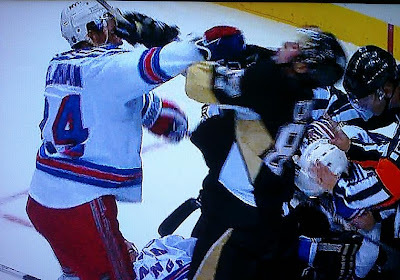 For as much tampering as there was, it added a bit of excitement to the game and even managed to royally piss off Lundqvist who played a spectacular game and tried to remain calm despite being tripped and later threatened by a tantrum throwing Crosby. 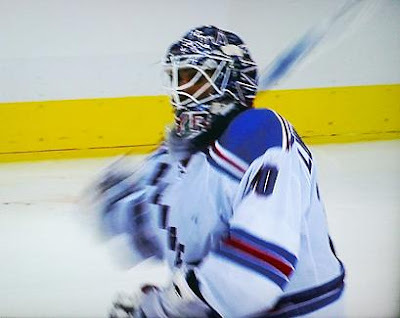 It would eventually boil over as one mystery penalty too many pushed Henrik over the edge and resulted in him breaking his stick over the crossbar following the second Pens goal. Then Henrik attempted to get some boomerang action going with the broken handle, in the direction of the officials. If not for the effort of the first line and a Marc Staal joining the play, all would have been lost. Instead, tied and going into overtime, our boys in blue decided to flip off the posterboys from Pittsburgh, the corrupt officials and the rest of the Gary Bettman circus. As much as I ride Dubinsky for that contract play at the beginning of last season, he did make a great Datsyuk-ian move to avoid the sprawling defensemen and feed Cally that winning goal. 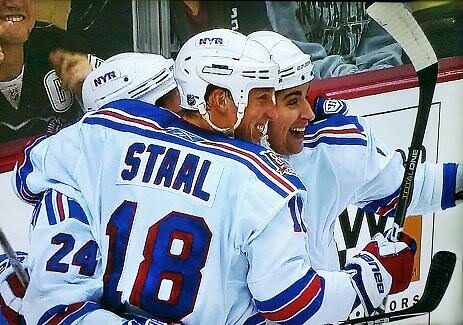 Staal did a great job staying high on that play - really shows his maturity. OMG!! Funniest thing I've read in some time!! Really, you should blog or something.